MAKE A DIFFERENCE IN SONOMA COUNTY! 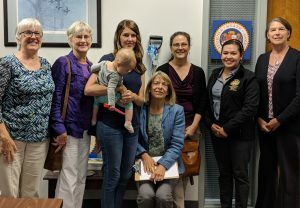 350 Sonoma, an all-volunteer non-profit, is working to slow climate change and promote climate justice in the county. We're part of 350 Bay Area and inspired by 350.org, the international climate action organization founded by Bill McKibbon. We meet the third Wednesday of the month at 7:00 p.m. at the Peace and Justice Center of Sonoma County, 467 Sebastopol Ave., Santa Rosa. Join us! 1. Register to vote. In California citizens can pre-register to vote starting when they are 16 (and can vote in elections when 18 or older). 3. Sign online petition asking the California teacher retirement fund (CalSTRS) to divest from fossil fuel companies. Volunteer at Santa Rosa Earth Day on April 27th to help with compost and recycling: Click this link to sign up to be a volunteer at Santa Rosa Earth Day April 27th. If you want to be on the compost/ recycling stations, write “Put me on the Green Team” in the “Additional Comments” section. This letter explains the campaign. Hi, my name is [FULL NAME ON VOTING REGISTRATION], I’m [AGE] years old and I live in [ZIP CODE], and I’m calling to ask that Senator Feinstein support a plan to stop the climate crisis that’s actually in line with what the world’s top scientists with the United Nations say is necessary. That starts with her cosponsoring Senator Markey’s resolution for a Green New Deal. I am scared to lose [what are you scared to lose?] to climate change, and I’m asking Senator Feinstein to support the resolution. Thank you. Public banks keep money in our communities, and provide local investment. Fossil fuel Infrastructure is made possible by big banks. Let’s divest our public funds from Wall Street and bring our money home! The Friends of Public Banking group in Santa Rosa is asking us to take action. They are collecting signatures of support for the California Public Banking Alliance (CPBA) legislative proposal. This will make it easier to establish public banks at the local level, so we can rebuild our local economy. Consider adding your name to the petition here. You can also write a letter directly to your Congressional Representative showing your support for public banking and our legislative proposal. Send a letter of support. Here’s a video explaining what public banking is and how it works. Come to Sebastopol City Council meeting on Tuesday, March 5th to support the city’s adoption of the ordinance written by Sonoma County Waste Management Agency: “Ordinance to Prohibit Use and Sale of Disposable Food Service Ware and Other Products Containing Polystyrene Foam” which would ban polystyrene foam and other disposable food ware that is non-compostable and not recyclable. Tuesday, March 5th, starting at 6pm at the Sebastopol Youth Annex, Teen Center, 425 Morris Street. Check here after Feb 28 for the agenda to estimate time item will be considered. 350 Sonoma has just joined over 600 environmental organization demanding our government officials support and activate the Green New Deal as a response to catastrophic climate changes. The Green New Deal proposes 1) Halting all fossil fuel leasing, extraction, and dirty energy subsidies, 2) Transition to 100% renewable energy by 2035 or earlier, 3) Expand public transportation and phase out fossil fuel vehicles, 4) Harness the full power of the Clean Air Act, 5) Ensure a just transition led by impacted communities and workers 5) Uphold indigenous rights as outlined in the UN Declaration of the Rights of Indigenous People. The letter also opposes rolling back environmental, health protections, corporate scheme that place profit over community health, including market based technological fixes. We ask that energy companies be held responsible for damages rather than shifting these costs to taxpaers. We thank our new Representatives, led by Alexandria Ocasio Cortez, for promoting this response to our real existential emergency. We urge you to sign on to support the Green New Deal and to spread the word among your families, friends and social media contacts.